Akuret Oil Gauge, fits 1926-1927 AND 1924-1925 sedans. 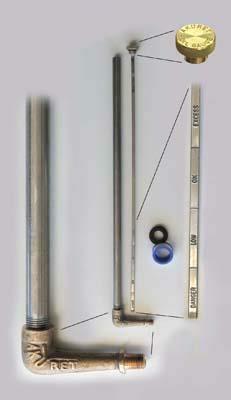 This is an accurate reproduction of an original accessory dipstick. It allows you to check the oil levels without even raising your hood. The dipstick reads “DANGER - LOW - O.K. and EXCESS ” and AKURET OIL GAUGE is engraved on the Brass knob which is visible at the side of the car. Replaces the lower petcock of the motor and comes through a hole you’ll have to make in the splash apron. Includes a rubber grommet to prevent rattle at the splash apron. Instructions included. ALSO, Includes frame quality copy of the front cover the May 1921 Ford Car Trade Journal and a copy of the 1920 Akuret Oil Gauge Patent.